85 days. Solanum lycopersicum. Open Pollinated. 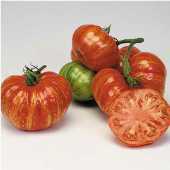 Plant produces good yields of 1 to 1 ½ lb bi-colored pink beefsteak tomatoes with golden stripes. They are mildly sweet and flavorful. Perfect for salads, slicing, and sandwiches. A potato leaf variety. Excellent choice for home gardens and specialty market growers. A heirloom variety from K. Sahin, Zaden B.V., Netherlands. Indeterminate.